Where, and what is Trevi Pasta? Ah...pasta. We have a love-hate relationship. I love to eat it but then I often hate myself afterward. It feels so indulgent sometimes, but I grew up on spaghetti and meatballs (and I'm not even Italian!). In my last visit to the College Park neighborhood of north-west Orlando, I had a chance to stop in to Trevi Pasta for lunch. Don't let this pasta scare you away. It's all home made, on premise including their sauces and their pastas! Trevi is somewhat of a rarity in today's metro Orlando. It's a family owned eatery run by a family from Italy. Trevi has a 'fast casual' approach to pasta, but with an authentic family feel to it as well. How is the atmosphere at Trevi Pasta? Trevi Pasta is run by a family that knows how to make pasta. They also know how to setup a small pasta eatery as well, as I felt like I was teleported to a small Italian cafe when I stepped in the front door. The establishment is bright but small, with a large case containing their gelato (see below), along with other desserts, pasts and other toppings and ingredients for their dishes. Trevi wasn't busy when I was there for lunch, but it can only accommodate around 25-30 patrons at a time. Get in while you can, because I am willing to bet as the word gets out on this place, it will be hard to find a seat! How is the menu at Trevi Pasta in College Park? One of the best parts about eating at a small, local eatery is the variety you'll experience. Variety is the spice of life, after all! 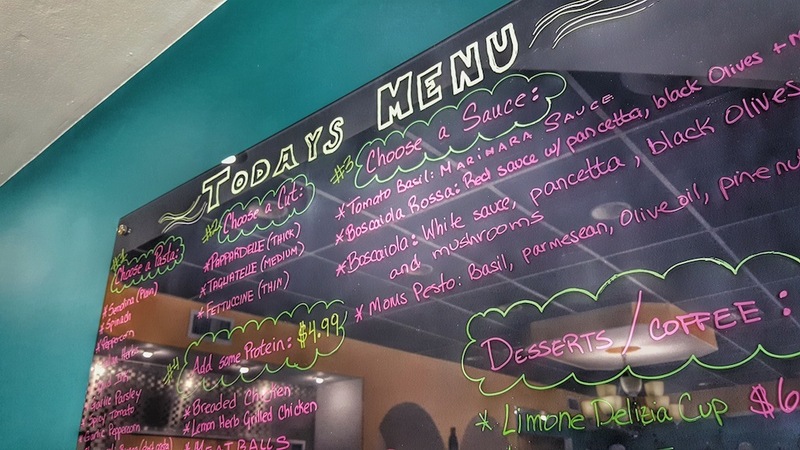 The menu at Trevi Pasta changes almost daily, hence their erasable menu board approach. The menu will typically contain a list of available pastas and accompanying sauce choices. You can combine any pasta and sauce together to fit your own taste. Dessert and coffee specials will be offered and change fairly frequently as well. Sure, there will be some consistency from day to day, but Trevi's approach to their menu can also be a great way to try new things! How is the food at Trevi Pasta in College Park? As mentioned, Trevi Pasta is a family affair. The proprietor pretty clearly had an Italian access, and in that moment, I knew I was in for a treat. She went on to explain that she hand-made all of the pastas and her mother home-makes all of their sauces. The offerings vary because it depends on what ingredients they have access to. 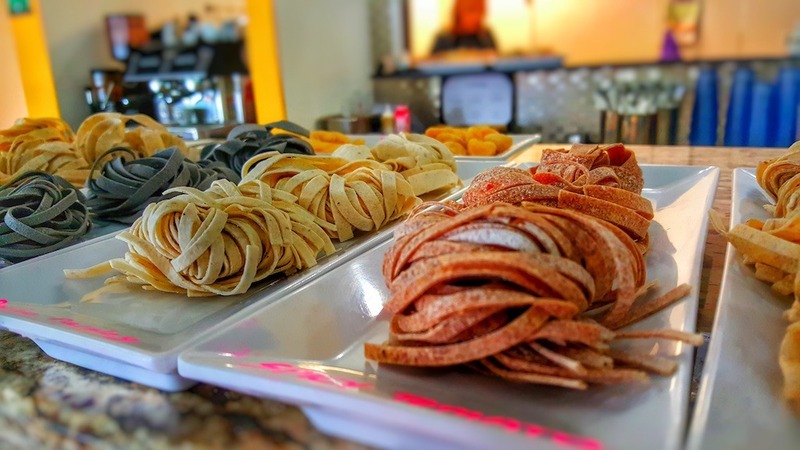 All of their pastas, ravioli and desserts are made right in Orlando and it truly shows. The menu is structured in much the same way many "fast casual" chains are going these days. You can pick your pasta, choose the cut (the thickness of the pasta), then choose the sauce and finally (optionally) add a protein. I personally ordered the Italian Herb pasta, tagliatelle (medium thickness) with tomato basil marinara and meat balls. Two words: holy wow! I felt like someone made that meal just for me - and that's much the way the meals feel at Trevi Pasta. Their made with a great attention to detail and flavor and it really comes out in the final product! I can't wait to go back and try a different pasta type, thickness and sauce combination. I'm actually thinking about trying the squid ink pasta next time! How is the Gilato at Trevi Pasta in College Park? 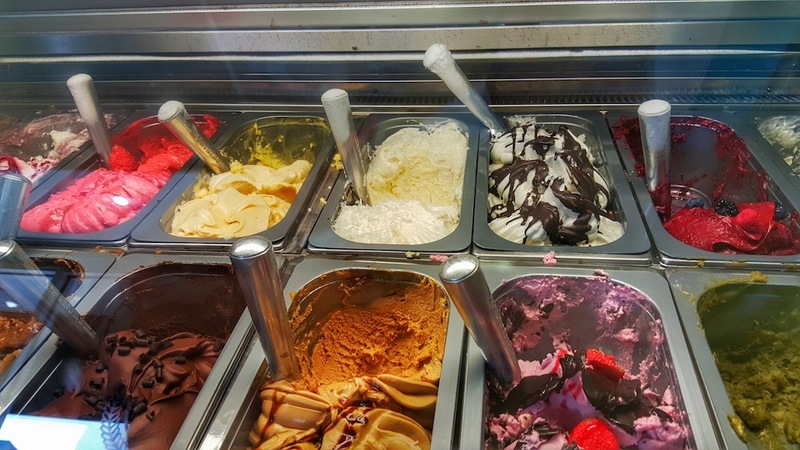 What's an Italian eatery without Gelato, right? Well, in many Italian restaurants, the Gelato is often an after-thought. Before we get into the flavors, I was first impressed with Trevi's willingness to let me sample as many Gelatos as I wanted! I "only" tried 4 or 5, but it was nice that they give you a sample before you commit. I decided on one scoop of the Italian Custard and one scoop of the bacio (described to be similar to hazelnut). The Gelato was awesome as well, and I appreciated that they let us mix the flavors. Two scoops of the same flavor may have been a bit too much. At $5 for 2 scoops, I found the price to be a bit on the high side, but it was worth it. The Gelato is clearly high quality. This is a 100% authentic, 100% honest review of Trevi Pasta Restaurant found in the College Park neighborhood of Orlando, Florida. Dadtography was not compensated in any way for this review. The photos in this review are Dadtography originals. Please don't use our photos without permission.